Get the most out of your kitchen sink with these chopping board and colander add-ons. Effortlessly bring your chopped goods from the chopping board to the colander for washing. Perfectly fits all Dante and Dromma sink variants. The Swedia Dante/ Dromma Colander and Chopping Board Set is a great addition to your kitchen needs. Aside from its versatile look, it is designed to make food preparation a breeze. 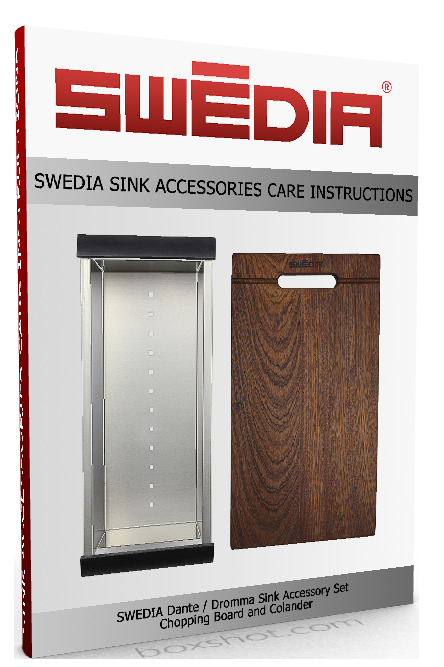 Chop and wash your vegetables all in one place with the Swedia colander/strainer and chopping board accessories for your Dante or Dromma kitchen sinks. Made from premium grade stainless steel, the colander can hold vegetables, fruits, and even pasta perfect for draining and rinsing, without any piece slipping out of it. Conveniently transfer the colander’s contents with its easy-grip handles. The chopping board is made from scratch and water resistant material – built to last long. The SWEDIA® Dante/ Dromma Colander and Chopping Board Set is a great addition to your kitchen needs. Aside from its versatile look, it is designed to make food preparation in a breeze. 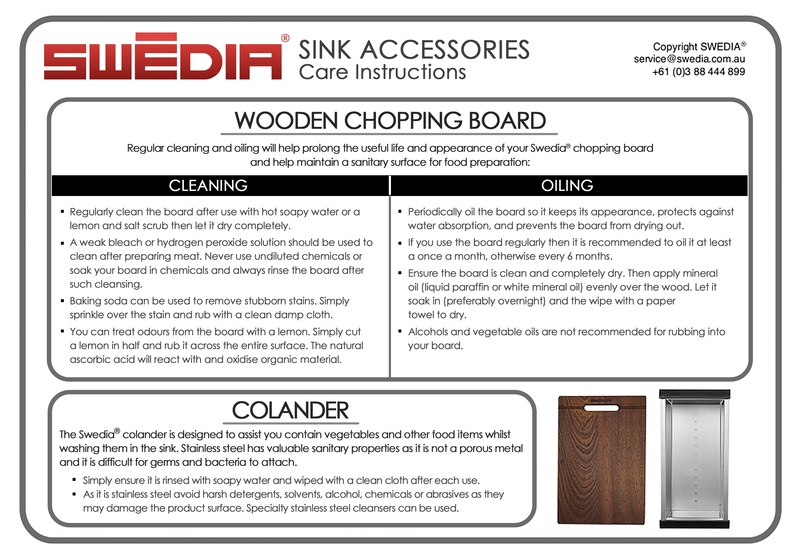 Chop and wash your vegetables all in one place with the SWEDIA® colander and chopping board accessories for your Dante or Dromma kitchen sinks. Made from premium grade stainless steel, the colander can hold vegetables, fruits, and even pasta perfect for draining and rinsing, without any piece slipping out of it. Conveniently transfer the colander’s contents with its easy-grip handles. The chopping board is made from scratch and water resistant material – built to last long. Regularly clean the board after use with hot soapy water or a lemon and salt scrub then let it dry completely. A weak bleach of hydrogen peroxide solution should be used to clean after preparing meat – however, never use undiluted chemicals or soak your board in chemicals and always rinse the board after such cleansing. Periodically oil the board so it keeps its appearance, protects against water absorption, and prevents the board from drying out. If you use the board regularly then it is recommended to oil it at least once a month, otherwise every 6 months. Ensure the board is clean and completely dry. Then apply mineral oil (liquid paraffin or white mineral oil) evenly over the wood. Let it soak in (preferably overnight) and the wipe with a paper towel to dry. The Swedia® colander is designed to assist you contain vegetables and other food items whilst washing them in the sink. Stainless steel has valuable sanitary properties as it is not a porous metal and it is difficult for germs and bacteria to attach. As it is stainless steel avoid harsh detergents, solvents, alcohol, chemicals or abrasives as they may damage the product surface. Specialty stainless steel cleansers can be used.